I headed off on a B road through Newbridge on Wye and onto Beulah. It was a pleasant enough road at first but it didn't take long to realise that I was crossing a series of river valleys. I don't want to sound like a moaning minnie but this was the worst road I've ever cycled! Up, down, up, down, I'll swear there wasn't a foot of flat ground on it! I don't mind climbing but I do like a bit of reward for it. This just climbed and plunged at a gradient between 10 and 15%, every time I thought I was on the final descent it went straight back up again. And I'd thought this was the flat part of the route! 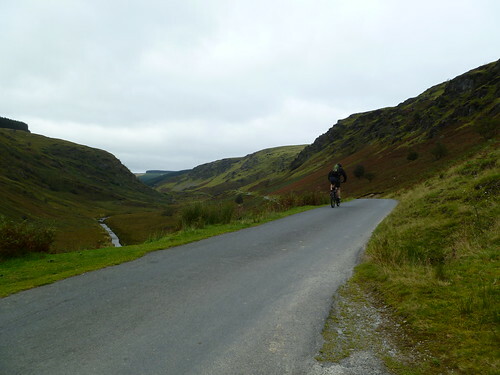 Eventually I crested the last hill and dropped down into Beulah where I turned right on a minor road signposted Abergwesyn. This immediately began to climb but this was a nice climb with a purpose, carrying me steadily upward through forestry and past an MTB trail centre. I paused at a junction where a sign said 'Unsuitable for Caravans'. As I studied the map a large group of mountain bikers shot out of the trees and headed up the road towards open moorland. 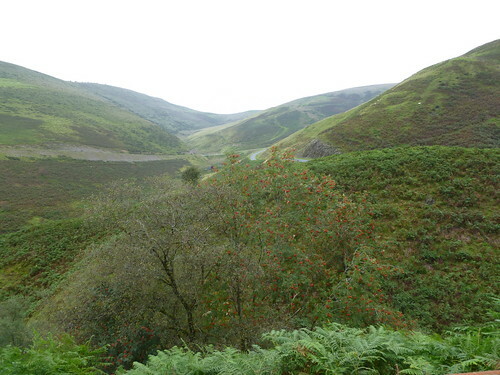 I followed suit, the road climbing steeply as we left the trees behind and emerged into a spectacular wild valley. It was a beautiful empty valley, the sort of place where you can hear the silence. The south of England is very pretty but it was great to be somewhere rugged and wild. I continued just behind the mountain bikers until we came to more forestry and they disappeared along a track as my road headed skywards. Even my road atlas showed black chevrons here so it was no surprise but it was certainly steep. 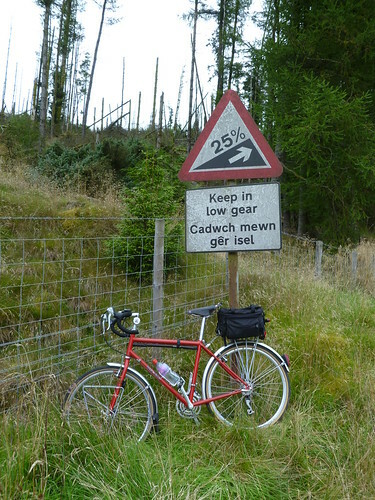 The last time I tried to cycle up a hill this steep I couldn't keep my front wheel on the ground and ended up doing a very hasty and rather painful dismount to avoid falling off. I decided to walk. Now I see why its unsuitable for caravans! 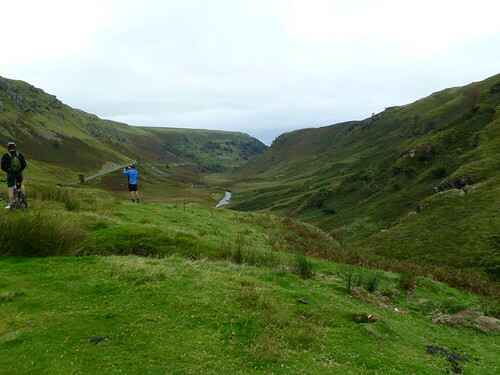 A steep plod up and then an almost equally steep descent down the other side led to more forestry and then spectacular open views over Llyn Brianne. Once past the reservoir the road began to drop, first through open moorland and then down into a valley of hanging woodland past the RSPB reserve at Dinas. The landscape was starting to soften now and houses were beginning to appear at the roadside. A tea room was a welcome sight and a pot of tea and a large slice of Barra Brith went down a treat. 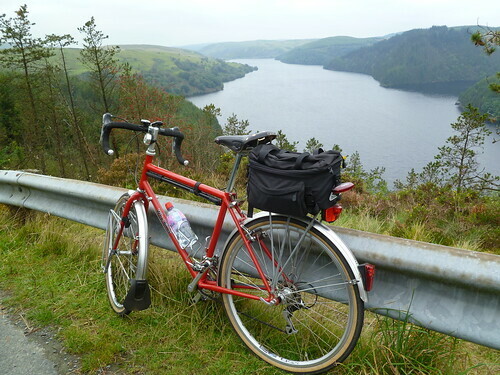 A couple at the cafe told me that it was all downhill from there to Llandovery. I tend to distrust such statements, especially from motorists, but it turned out to be absolutely right and the last few miles were a pleasant easy cruise. Apart from the first bit to Beulah this had been forty five miles of magnificent cycling country, hilly and spectacular. Posted by Hilary on September 28th, 2012. That ride looks like hard work. On our family holiday I was normally allowed to do rides like that on my own when the weather was bad and very very wet. Fabulous ride Hilary, Im most envious. Scenery is spectacular in Wales. Thanks for the clip Mary, its brilliant! 😀 I've certainly not seen it before. Whoa! I hadn't seen that clip before. Scary stuff. Isn't it nice to sneak in a cheeky ride when you're away on family hols? The best of both worlds. Well captured photos, as always. Did you remember to pack everything except your water bottle?